Our publication schedule for The eBullet has been altered by the sad loss of George Lindsey on May 6 and Doug Dillard on May 16. This issue, devoted to Doug Dillard, is the second of two Special Editions of The eBullet that we're doing before we publish our next regular issue of The eBullet, which was originally scheduled for May, but now will be published later this month. In the meantime, be sure to check our online Event Calendar to stay current on the latest happenings in Mayberry. And TAGSRWC's online Weaver's Dept. Store has some new items and nice discounts on popular Mayberry items you might find worth a look before the delayed regular eBullet comes out after Father's Day. Also, at the end of this issue, we have provided some links to other stories and sites with their tributes and coverage about Doug's life, including an especially good compilation by the International Bluegrass Music Association (IBMA) site, which features extensive comments by Rodney Dillard, Dean Webb, Ginger Boatwright and many others. 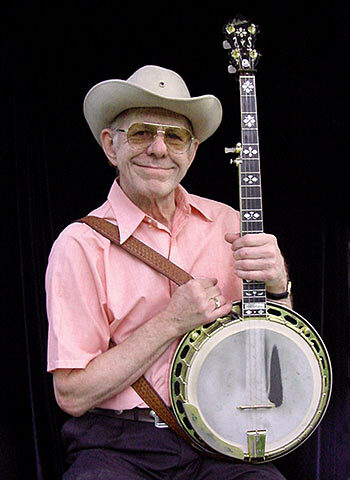 NASHVILLE, Tenn., May 18, 2012--Bluegrass banjo virtuoso Doug Dillard died here on Wednesday, May 16, 2012, after a long illness. His wife, Vikki, was at his bedside. He was 75. It was stated a few years back that, whenever people in the bluegrass music world start counting the all-time great banjo pickers on one hand, Earl Scruggs is always the thumb, and Doug Dillard is always the index finger. Doug's dazzling picking entertained and inspired generations of fans and fellow musicians across all genres, from the Ozarks and Hollywood to Mayberry and Carnegie Hall. Douglas Flint Dillard, the second of three sons in the musical family of Lorene and Homer Earl Dillard, Sr., was born March 6, 1937, in East St. Louis, Ill., and grew up in Salem, Mo. Doug started playing guitar at age five and fiddle around the same time, and he picked up his first banjo, a Kay model that was a Christmas present from his parents, at the age 15. Doug learned his own style of three-finger picking by listening to the early recordings of Earl Scruggs, Don Reno and Ralph Stanley. 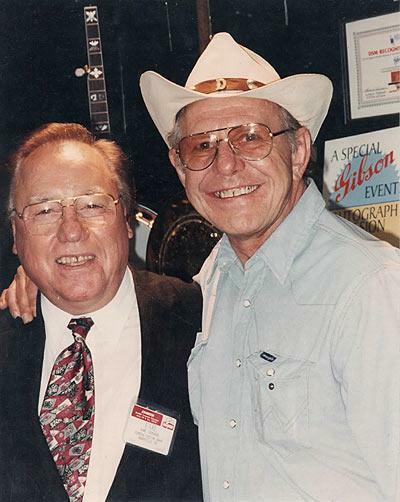 Doug often recalled the first time he heard the music of Earl Scruggs. "I was driving down the road with the radio on. All of a sudden, I heard this incredible banjo music. I got so excited that I drove off the road and down into a ditch. I had to be towed out." That was the beginning of one of the longest lasting admiration societies in music. Earl Scruggs was Doug's banjo hero. Young Doug wrote Earl a personal letter in which he asked, "Is sixteen too young to learn the banjo?" Earl graciously replied and supplied the needed encouragement. Doug then pestered his parents into driving him to Scruggs' home in Madison, Tenn., some five hundred miles away from Salem. With courage not usually found at that young age, Doug boldly walked up to Scruggs' front door and rang the bell. He introduced himself and asked Earl to install "Scruggs Tuners" on his banjo. Earl kindly installed them and even brought out this own banjo for Doug to inspect. He also gave Doug a couple of finger picks and showed him some techniques for using them. In 1956, Doug played banjo on the local weekly radio show hosted by Howe Teague on KSMO in Salem. 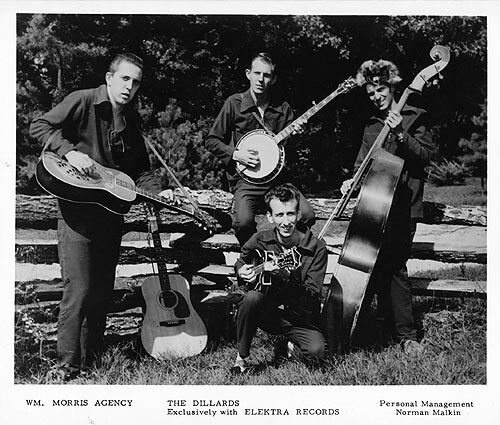 From 1956 to 1959, Doug and younger brother Rodney, along with Bill Glenn, Henry and Jim Lewis, and Paul Breidenbach, formed The Ozark Mountain Boys. Mitch Jayne, a local radio personality (and future member of The Dillards), invited the band to play on "Hickory Hollow," his Saturday morning radio show on KSMO. Doug also played banjo for The Hawthorn Brothers, and during that time he appeared on television with the group Lee Mace and the Grand Ozark Opry. In 1958, Doug and Rodney joined Joel Noel and The Dixie Ramblers. Based in St. Louis, this band featured John Hartford, Buddy Van Hoosier and Joel Noel. Shortly after joining The Dixie Ramblers, Doug and Rodney began recording for Mario Records (K-Ark Records) a St. Louis based record label. Their first single was "Banjo in the Hollow." Three more releases followed. Soon thereafter billed as The Dillard Brothers, Doug and Rodney began to perform on their own. Doug and Rodney met Dean Webb, a masterful and intuitive mandolin player from Independence, Mo. Next came Mitch Jayne, the radio announcer at KSMO in Salem who by this time had been friends with Doug and Rodney for a few years. With the help of Doug, Rodney and Dean, Mitch learned to play the bass fiddle. Mitch had a very keen wit, original down-home Ozark humor and a sense of natural comedic timing, all of which, when combined with his bass playing, rounded out the sound, look and personality of The Dillards. In 1962, The Dillards played their debut show at Washington University in St. Louis. That first performance as The Dillards held such high energy that the crowd roared and stomped with enthusiasm over the sheer passion of the playing and singing by The Dillards onstage. Bluegrass music had finally arrived on the college campus. The Dillards knew then that they must go to Hollywood and bring their special sound to the music world at large. They left Salem in pursuit of a recording career in the big city. (Doug reasoned that if the group's music career didn't pan out, he could always fall back on the accounting expertise he had from his studies at Washington University and his work experience as a bookkeeper.) At that time, most country music was produced and recorded in Nashville. Country music and bluegrass music were virtually nonexistent in Hollywood. Once The Dillards arrived in Los Angeles, they discovered the burgeoning folk scene that was happening at a club called The Ash Grove. The Dillards took their instruments up onto the stage one night for the club's customary after-hours jam session. Jim Dickson, an A&R man from Elektra Records, happened to be there and witnessed this incredibly talented new group fresh from the Ozarks. By the next night, The Dillards were signed to a multi-album recording contract with Elektra. Richard O. Linke, Andy Griffith's manager and an associate producer of "The Andy Griffith Show," spotted the announcement of the record deal in Variety magazine. Linke contacted Elektra Records and arranged to audition the band for the "Griffith" show, which was looking for the right group to play a musically inclined backwoods mountain family. 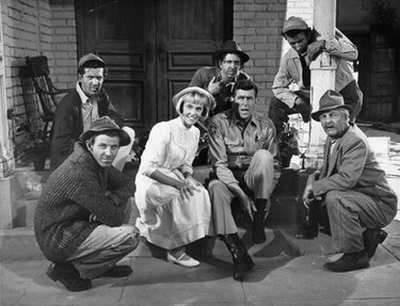 They were signed immediately as recurring performers, along with Denver Pyle, who played father Briscoe, and Margaret Ann Peterson, who played the boys' sister, Charlene. Together they became the rustic and beloved Darlings of Mayberry. 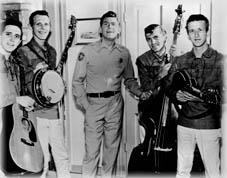 Whenever possible, Andy Griffith graciously allowed and encouraged The Dillards to perform their own tunes on the show. When Andy heard one of Doug's original instrumentals, he asked what it was called. When Doug said it didn't really have a name yet, Andy christened it "Doug's Tune." It would become one of the signature banjo instrumentals in all of bluegrass. 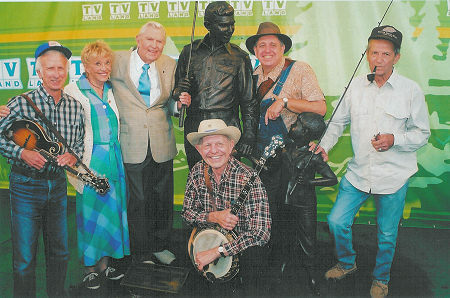 At the TV Land Landmark dedication in Mount Airy in 2004. The Dillards, rarely saying an audible word of dialogue, appeared and performed music as the Darling boys in six episodes of the "Griffith" show between 1963 and 1966, and in doing so helped to introduce the urban American television audience to the special brand of mountain music that The Dillards performed. With their high energy, musical talent and lively presentation, The Dillards brought bluegrass music and mountain culture directly to the large audience for one of America's top-rated television shows. The Dillards also made many guest appearances on other high-profile TV shows, including "The Judy Garland Special" and "The Tennessee Ernie Ford Special." They likewise were a hit at the Newport Folk Festival, Monterey Folk Festival, UCLA Folk Festival and New York Folk Festival. The Dillards during this time and later toured with Elton John, Bob Dylan, Joan Baez, Carl Perkins and many others. On their tour of the United Kingdom, they received The Edison Award for their excellence in music. Not long after The Dillards finished work on acclaimed albums with Glen Campbell and Byron Berline, Doug decided to part musical ways with the group. He wanted to explore some new musical territories, and he hooked up with The Byrds for their first European tour. 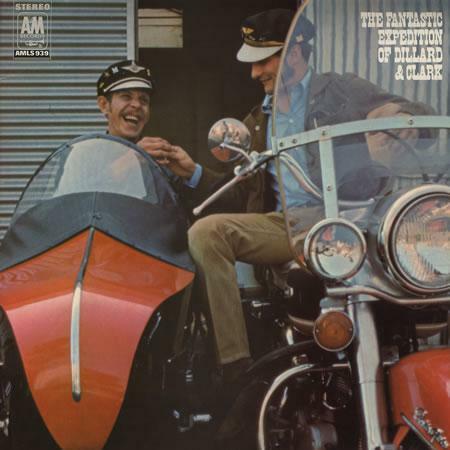 In the sidecar with Gene Clark. After the tour, Doug and ex-Byrd front man Gene Clark teamed up to form a completely new sound, a blend of back-hills country and rock music. The band at this time consisted of Bernie Leadon, Mike Clarke, Byron Berline, David Jackson, John Corneal, Don Beck and Donna Washburn. Doug and Gene Clark recorded landmark albums as The Dillard-Clark Expedition and as Dillard & Clark. 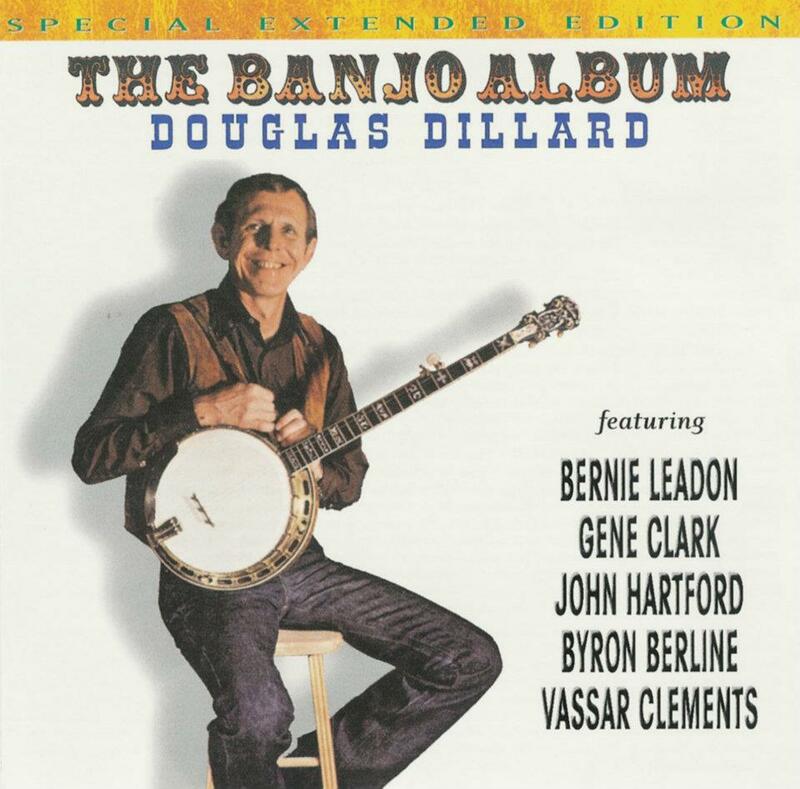 In 1969, Doug recorded the critically celebrated Banjo Album. Other solo projects followed in the early 1970s. Doug signed as a regular cast member on "Music Country USA," a Nashville based television show on which he performed the theme song "Runaway Country." He also had a recurring guest spot on "The Dean Martin Show." 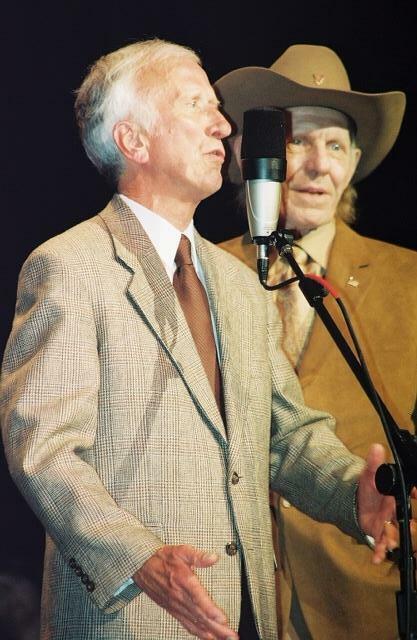 In the late 1970s, Doug reunited with childhood pal John Hartford and with younger brother Rodney Dillard to record albums in Nashville for Flying Fish Records. With Maggie Peterson and Howard Morris at Mayberry Days. In 1979 Doug recorded as a solo artist for Flying Fish and released two classic banjo albums, Jackrabbit and Heaven. After moving to Nashville in 1982, Doug formed The Doug Dillard Band with Ginger Boatwright on vocals. Key members of the band over the years included David Grier, Roger Rasnake, Jonathan Yudkin and Kathy Chiavola. The band recorded a couple of albums, including their 1988 release, Heartbreak Hotel, which was produced by Rodney Dillard and nominated for a Folk-Bluegrass Grammy Award. 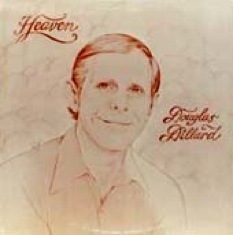 Doug Dillard's extensive session work included albums with Hoyt Axton, Johnny Cash, Arlo Guthrie, Vassar Clements, Harry Nilsson, Bob Lind, Linda Ronstadt, Kay Starr, John Hartford, Glen Campbell, The Monkees, Aztec Two Step, Gene Clark with The Gosden Brothers, The Byrds, Judie Sill, Jess Pearson, James Lee Stanley, Steven Fromholz, Tom Pacheco, Michael Melford, Paul Hann, Michael Martin Murphey, Woody Guthrie, Ray Park, John Anderson, Larry Groce, Michael Nesmith, Ron Davies, Jim Ringer, Millenium, Hayseed, Larry Perkins, Byron Berline, Doug Kershaw, The Beach Boys and Ginger Boatwright. Doug also worked on numerous motion pictures--both scoring and performing in many, such as Bonnie and Clyde, Junior Bonner, Vanishing Point and 1980's Popeye during which Doug suffered a near-fatal fall that left him in a coma for weeks. 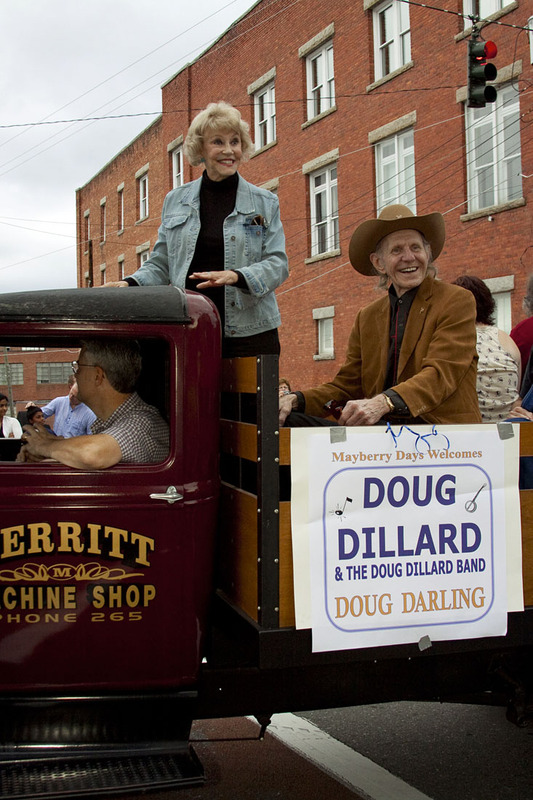 Doug was a headliner with his Doug Dillard Band for every Mayberry Days festival held to date in Andy Griffith's hometown of Mount Airy, N.C., each September since 1990. He was the only performer to participate in every Mayberry Days--22 in all--through 2011. Doug and The Dillards received countless professional honors and accolades through the years. 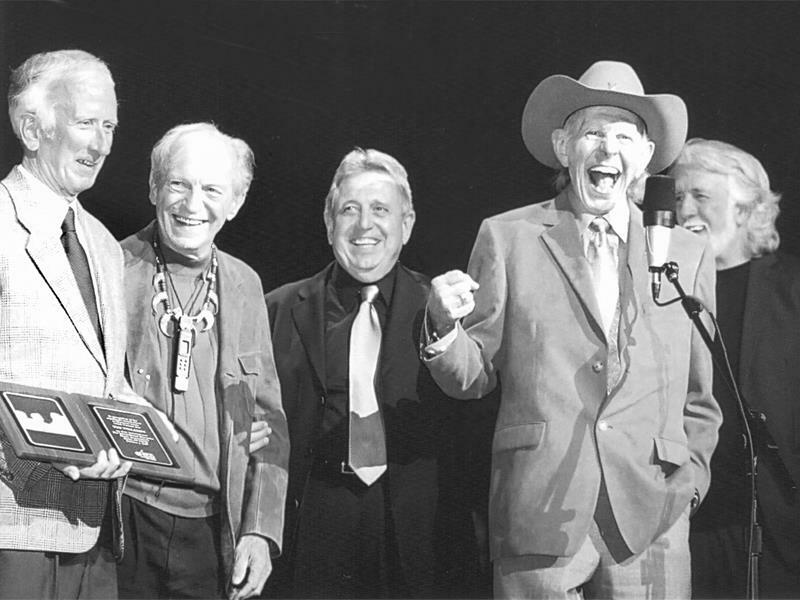 Perhaps most special of all was when Doug and his three fellow original Dillards members were inducted into the International Bluegrass Music Hall of Fame in October 2009. Longtime friend John McEuen, a banjo disciple of Doug's and a founder of the Nitty Gritty Dirt Band, presented The Dillards with the honor. Original Dillards member Mitch Jayne died on August 2 the following year. 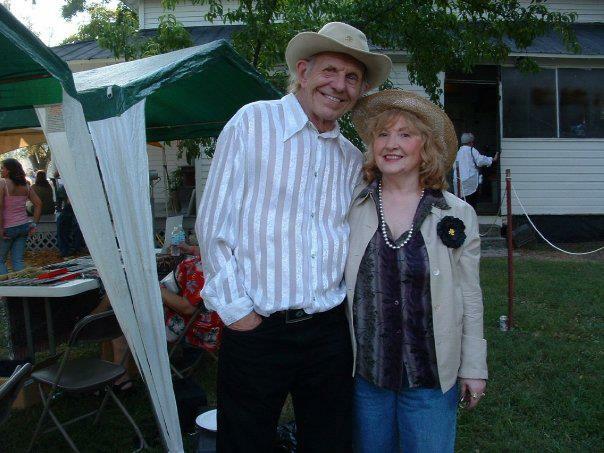 Doug was married to singer-songwriter Vikki Sallee-Dillard of Nashville. They were partners and best friends and had many happy years together. Doug was preceded in death by his parents, Lorene and Homer Earl Dillard, Sr. In addition to his wife, survivors include: older brother Homer Earl Dillard, Jr. (and wife Halene), of St. Louis, Mo. ; niece Earlene (Sissy) Schmidt of Houston, Tex. ; nephew Earl J. Dillard of St. Louis, Mo. ; younger brother Rodney Adean Dillard (and wife Beverly Cotten-Dillard) of Branson, Mo. ; nephew Brian Adrian Dillard of Kingsport, Tenn.; niece Rachel Dillard of Branson, Mo. ; stepdaughters Kelley Snead of Thompson's Station, Tenn., and Kristi Ritson of Peachtree City, Ga.; and grandchildren; as well as numerous cousins, great-nieces and great-nephews; and his beloved dog, Venus. Funeral services will be held on Thursday, May 24, at 1 p.m. in the chapel at Harpeth Hills Funeral Home, 9090 Highway 100 in Nashville. Burial will follow onsite at Harpeth Hills Memorial Gardens at 3:30 p.m. Visitation with the family will be on Wednesday, May 23, from 4:00 to 7:00 p.m., at Harpeth Hills Funeral Home. 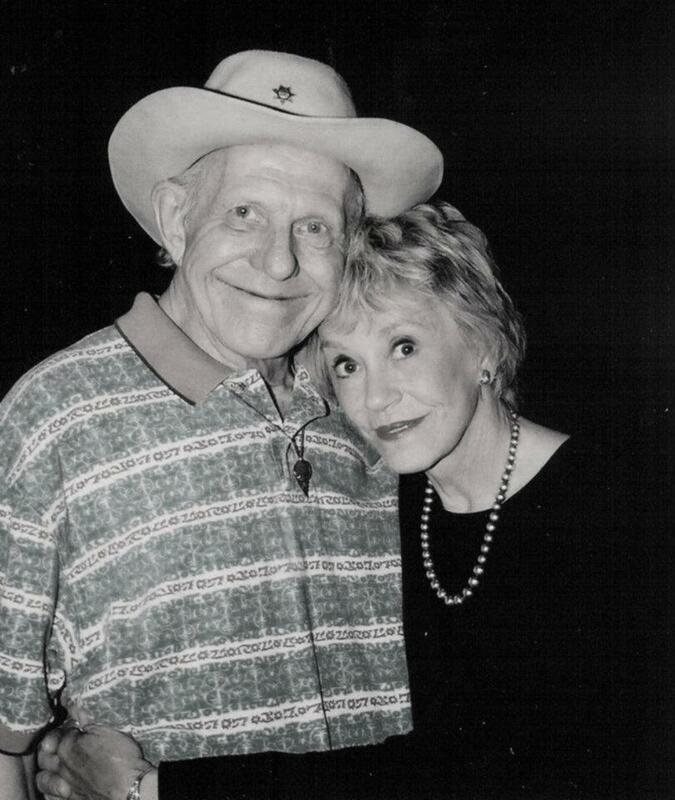 In lieu of flowers, donations may be made to the Douglas Dillard Legacy Fund, PO Box 90537, Nashville, TN 37209. Click this link for Harpeth Hills Funeral Home website. Editor's Note: Much of the information in the tribute above is adapted, sometimes verbatim, from the biographical notes written by Dillards music publisher Lynne Robin Green for www.dougdillard.net (no longer active domain). Following are reminiscences and tributes for Doug from a few people who knew and loved this happy man through the years. It was my good fortune to play the part of Charlene Darling on "The Andy Griffith Show." As such, I became part of a mountain family consisting of The Dillards and Denver Pyle. We clicked as a family from the first script reading. I found myself with four lovable brothers. I love banjos and banjo players! In real life, I have a brother who plays banjo. 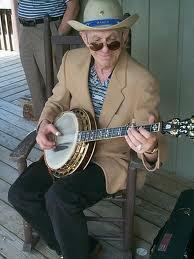 So it is ironic that I should be blessed with another banjo-playing brother on the "Griffith" show. And what a banjo player he was! On the set, Douglas dazzled me with his playing. So energetic. So fast, so...well, Doug. Then there is that adorable face. Yes, adorable. No one could grin like Douglas. He would light up a room with that grin. And his fingers would supply the electricity! Everybody back on the truck! 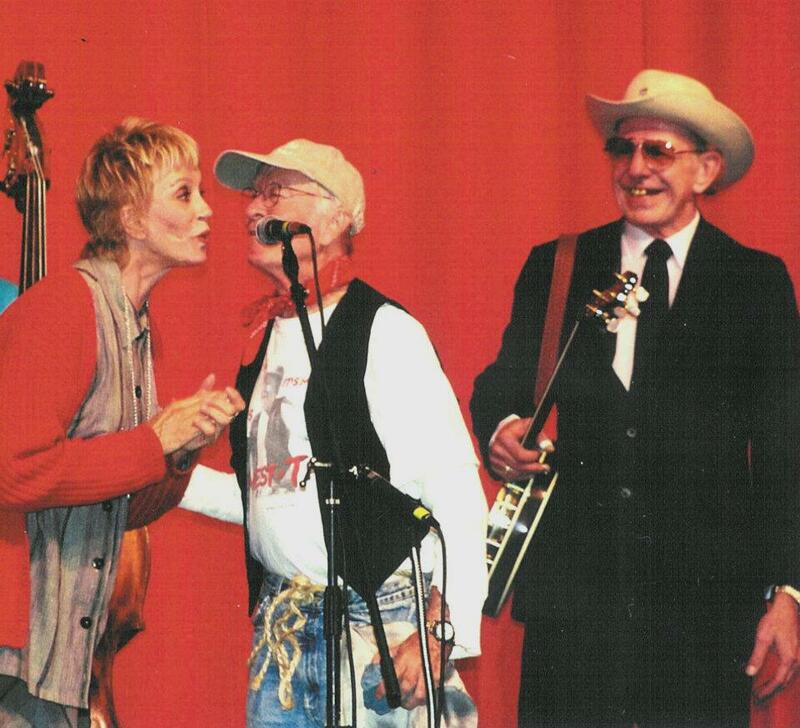 Maggie and Doug (with Ginger Boatwright and Roger Rasnake) at Mayberry Days 2011. One of my favorite times I spent with Doug was when we found ourselves together on a plane flight. He a had a bluegrass publication featuring an article about him. He was so proud. And I realized just how renowned he was as a banjo artist. We laughed and reminisced throughout the flight. I feel fortunate to have known him and performed with him. His warmth, kindness, and artistry will be mine to remember always. Mayberry will never be the same without Doug Dillard. Doug was just a great guy. And of course a very innovative banjo player. He played licks that people can't duplicate today. I know several pickers who play tunes like, say, "Doug's Tune," and they try to copy some of the licks he did, and can't do it. When he played, it was almost like it was something mechanical rather than a human being. People just can't see how he could play those licks. He just got it down so tight and clean. Dean and Doug at the IBMA Awards. He had a great sense of humor--all kinds of funny little off the wall sorts of things he would say. Somebody came up to him one time and said, "I saw your car parked, so I left a note under the windshield wiper blade." Doug said, "You know where my car is?" Back in those days, I had to play sort of the cool one, the straight man, because Rodney was acting goofy and Mitch was talking and Doug was smiling ear to ear. I needed to be somebody else. We had a lot of fun in the years we played together. When we talked, I would tell Doug I loved him and he'd tell me the same back. You get pretty fond of somebody you work with for a long while like that, and when you go through a lot together. I thought the world of Doug. Just simply, Doug Dillard meant the world to me, to the Surry Arts Council, and to Mayberry Days. Doug is the only actor from "The Andy Griffith Show" to attend and perform at all 22 Mayberry Days--including September 23, 2011. When Doug took the stage, the memories of Mayberry were enriched by the best banjo picking ever to be heard at the Andy Griffith Playhouse. 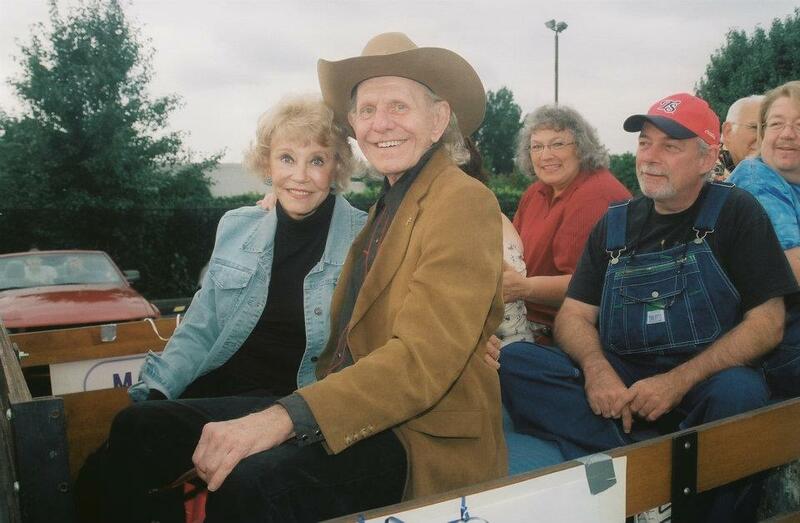 We will miss his smile on the "Darlings" truck in the annual Mayberry Days Parade, his incredible and sincere comments each year at the Mayberry Days Proclamation, his commitment and loyalty to the Surry Arts Council, and his ever enduring kindness. During Mayberry Days in 2009, Doug presented his 1990 Mayberry "Day" T-shirt to the Andy Griffith Museum. It's quite a treasure to those of us who witnessed Doug signing hundreds of shirts and having his photo made with everyone who came that first year. And, by the way, I will treasure my personal 1990 Mayberry Day T-shirt that was signed by Doug Dillard! I will also personally remain grateful for a 22-year friendship with an incredible man, an incredible musician and performer, and my true friend. Thanks, Doug, for the memories --and the tunes. The Doug Dillard Band performing at the 2011 Mayberry Days festival. Left to right are Jim "Vip" Vipperman, Roger Rasnake, Ginger Hammond Boatwright, Buddy Griffin, Doug Dillard, and LeRoy McNees. Photo by Hobart Jones. 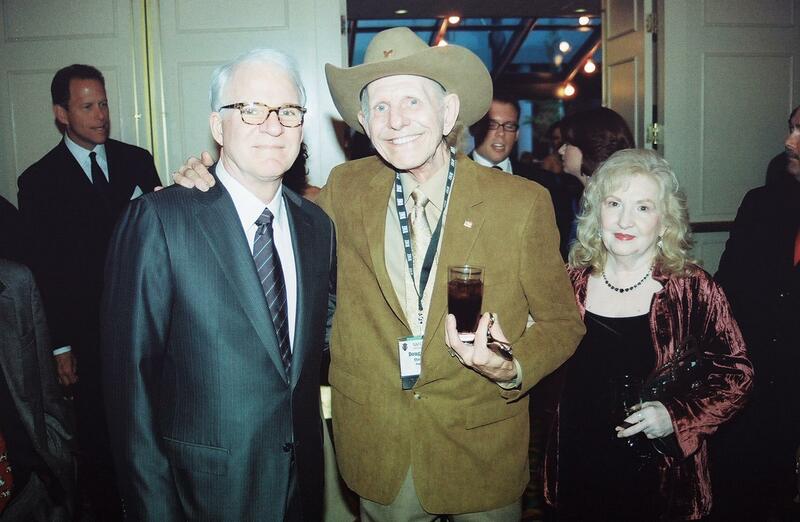 Steve, Doug and Vikki at 2009 IBMA Awards. 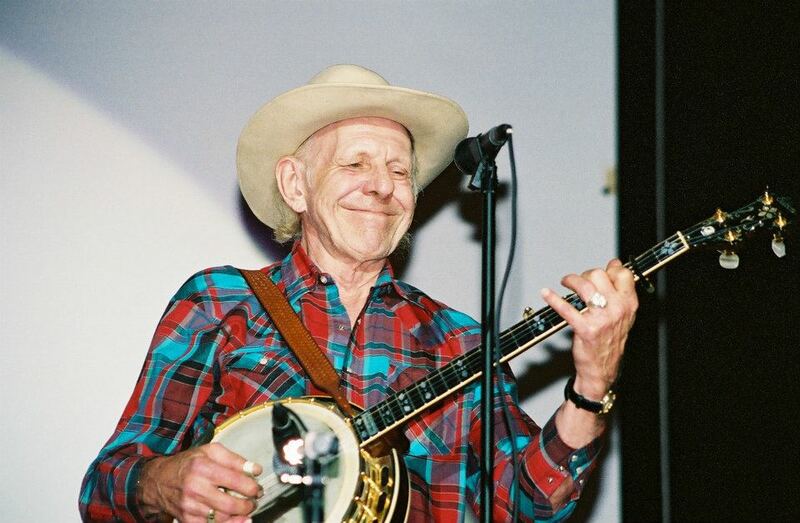 "Doug Dillard was a banjo icon. He, along with his group, the Dillards, influenced so many players. ... He was fast, clean and a melodic player with his own style." My mentor, the person who showed me that music was exciting and fun to play on stage for people...the one who was "impickable" with the execution of his art...Douglas Flint Dillard...whose grin would hit the back of the wall from any stage he was on...has passed away. There were many times, after I became a "hanger on" at 17 years old, The Dillards allowed me to hang out in their dressing room as they tuned up to go on for yet another sold-out L.A. club show. I would sit there pretending to read a book, but listen like a hawk watches, trying to pick up new nuances of notes. Often, on the way to the stage, Douglas would turn to me and play an incredible previously unheard lick to impress me, and I would ask where that came from. He'd mention another player that he was emulating at that moment, and tell me to check them out. I did. Then he went onstage and played his own style that kept me mesmerized. All smiles at the IBMA Awards (l-r): Dean Webb, Mitch Jayne, Rodney Dillard, Doug, and inductor and friend John McEuen. So often I went to see them, sometimes 2 to 3 times a week when they did the L.A. club circuit (usually a week at each place, and there were 8 of them), that my mother told me after that first year or two that I should change my last name to Dillard. Changing my college major from math to banjo was an easy decision that came along then. The fire to be a musical performer had been ignited. One time, at an after-show picking party at the club owner's house, Doug broke a string on his banjo. I always brought mine along, but never played in front of him. I spent many hours studying his attack, strings, setup of his instrument, method of playing, stance, tone...all in vain to try to make mine sound like his. My banjo just did not sound like his. I offered him the use of mine while I changed the string. He started playing it, and...it sounded just like his. That is when I learned "it's the archer, not the bow." I am grateful to have been able to call Dillard a friend. There would not have been a Nitty Gritty Dirt Band with me in it if it had not been for Doug. Consequently, there would not have been a Will the Circle Be Unbroken album if not for him. Thank you Douglas for what you did for me. Editor's Note: This is the text Bernie read at Doug's funeral service on May 24th. He has kindly allowed us to share it here. His remarks cover a lot of fascinating history with Doug. (Not mentioned is that Bernie was a founding member of the Eagles and that he also played banjo for a while with the Nitty Gritty Dirt Band.) Bernie and Doug were great friends to each other, most especially at the beginning of Bernie's career in music and in the last few years of Doug's life. Pete Seeger once said that if everyone were issued a banjo at birth, there wouldn't be any more wars. I get what he was saying--the banjo is an instrument that makes people happy. So Douglas Flint Dillard spent his working life making people happy. The fact he had a grin so big that The Dillards' bass player Mitch Jayne used to say that he looked like a "possum eating bumblebees," only served to make the point that this was supposed to be fun when Doug was playing. He enjoyed picking immensely, and was only too willing to stay up picking way past midnight with anyone who was willing to hang out with him. Many of us had that experience with Doug. We have heard the story of when Doug at age 15, in Missouri, asked his father to drive him to Nashville to go visit Earl Scruggs at his home. Doug bought a set of string bending "Scruggs Tuners" from Earl, who installed them at his kitchen table with Doug watching. That would have been about 1952, since Doug was born in 1937. And I myself made my own pilgrimage to Earl's home in Madison, Tenn., in 1965, when I was 18, driving up from Florida in the middle of summer in a Ford Falcon without air conditioning, before the interstates were finished. After discovering the Dillards' music in a record store, I spent many hot months in Florida bent over a record player, slowing it down to 16 rpm to learn every lick Doug played on Backporch Bluegrass, Live Almost and all the Dillards records. A few years later, when I was 20, after moving to Los Angeles, I made my pilgrimage to Doug Dillard's apartment in Beachwood Canyon in L.A., right below the big Hollywood Sign. Our mutual friend Bill Martin, who was here in Nashville visiting Doug on his birthday this past March and was in Doug's apartment at the time, recalled that I knocked on the door, and when Doug opened the door, I said: "Hi, I'm a banjo player from Gainesville, Florida, and I'm here to learn everything you know", and Doug said "Well, come on in!" I pretty much didn't leave. I didn't have anywhere to live, and Doug let me sleep on his couch for over a year. They fed me when I looked hungry, and the neighbors did too, sort of like I was a stray cat. I was, but the obsessed banjo type. Shortly after I arrived, Doug left his seminal group, The Dillards. I had been in town about a year already, and had been able to get to many of their shows at clubs in town, and knew many of their routines, but The Dillards breaking up to me was worse than the Beatles breaking up. So the upshot was that Doug had more time to pick with me, and pretty soon musician Don Beck and bassist David Jackson were coming over to play, and Doug was making up banjo instrumentals, and we were having a big time playing in Doug's 1920s Spanish apartment with the high ceilings, hardwood floors and huge tile bathroom that we would all squeeze into sometimes for the echo. Pretty soon ex-Byrds singer-songwriter Gene Clark started coming over, playing harmonica, and after we would play these instrumental songs all afternoon, Gene would come back the next day with lyrics, and we would sing the new song in three- or four- part harmony. 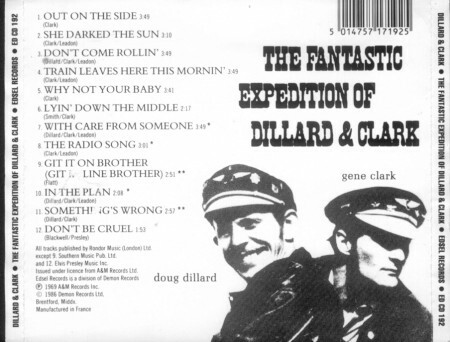 We had written an entire album's worth of songs in a couple weeks, and since Gene was signed to A&M Records, in another two weeks the first Dillard and Clark album was finished, called The Fantastic Expedition. Wow, the music business can be fun! We did great while playing in Doug's big apartment, but when we began playing shows for the public, it wasn't so easy, and things fell apart fairly quickly. I got an offer to join another group on the A&M lot, the Flying Burrito Brothers, which I took, and I was no longer seeing Doug every day. I got very busy touring and recording full time, got married, lived in Hawaii and Vermont, and eventually moved to Nashville in the late '80s, shortly after Doug had also. We saw one another occasionally after that, but not that often. After a few years, after a divorce, I had the proceeds from the sale of my house in L.A. to reinvest. I bought a farm outside Nashville, and shortly thereafter ran into Doug in a Nashville club. "How are you doin'?" he asked. I reported my news that I had bought a farm, and wasn't this great? I was all excited about it. Doug paused a bit, and said quietly, "I've spent my whole life trying to get OFF the farm." I saw Doug play shows down at the Station Inn in the '80s and '90s, with Ginger Boatwright, David Grier, and others. We didn't see one another that often. But here in the last several years, I began to make a point of calling and visiting Doug. He mentioned one day that the neck on his prized Gibson Bella Voce banjo was needing work, and I took him down to the Gibson factory in Opry Mills to re-introduce him to the current management. They were happy to make him a brand new neck for his banjo and Doug was extremely happy to get this work done. I met his sweetheart Vikki, and Doug and I were able to do a bit of picking. When he went into hospital this last time, I made time to go visit him fairly often, and we both appreciated the reconnection. We told a lot of stories, and some of them may even be true! The deal for me is that Doug was a pivotal person in my life. I didn't remember how pivotal until I really thought about it in the past couple years. 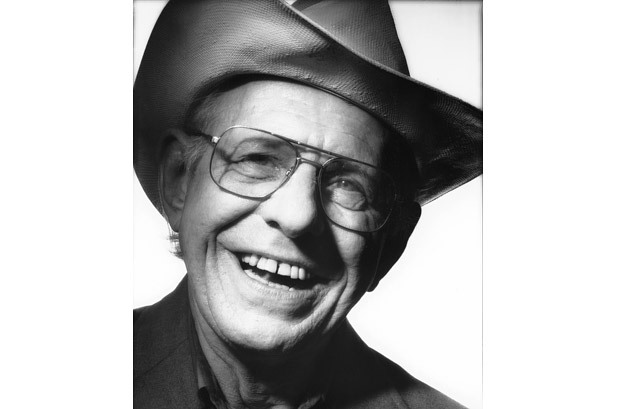 As John McEuen said, encountering Douglas Flint Dillard changed my life. I probably would have run off with the banjo and rock and roll circus anyway, but Doug supercharged my playing, and they say imitation is the sincerest form of flattery. I surely have enjoyed the short moments when my playing reminded me of Doug. But no one else played like Doug. Now Doug's mission here on planet Earth is finished, at least this episode. It is now suddenly clearer to me how correct Pete Seeger is about the banjo. And we are all links in the chain of carrying the message, that we can be a bit happier if we try, by playing ourselves, having the patience to show others how to play something, and encouraging them. Playing music not only cheers us up, but everyone around us as well. 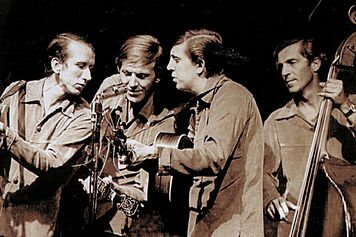 Earl Scruggs was excited about what Snuffy Jenkins was playing, Doug was excited about what Earl and Don Reno were playing, me and the other players coming up were excited about what Doug was playing and so on. There have now been several generations of players who have matured after Doug, many of them great indeed, but none of them have the same attack, directness and flat-out fire that Doug played with. He is, and will always remain, one of a kind. God bless, Doug. We are all extremely blessed that you passed our way. God Speed. The funeral service for Doug was held at Harpeth Hills Funeral Home in Nashville on May 24th. It was a service of prayers, praise and musical tributes from friends and family. Among those attending were Dillards mandolin player Dean Webb and his wife, Sandy, and Diana Jayne, widow of Dillards bass player Mitch Jayne. Flowers included a full-sized banjo-shaped arrangement made of red and white carnations from Dillards music publisher Lynne Robin Green and a beautiful arrangement from Betty Lynn. Friend Tony Gerber played flute as folks arrived. Doug Dillard Band members Ginger Boatwright and Kathy Chiavola beautifully performed several songs from Doug's Heaven album. They were accompanied by Sam Bush, Bernie Leadon, and recent and former Doug Dillard Band members Roger Rasnake, David Grier, Jonathan Yudkin, and others. Doug's older brother Earl eulogized Doug, and then Earl's son, Jay, played "Doug's Tune." Younger brother Rodney then performed "There Is a Time," accompanied by wife Beverly and Sam Bush. Rodney then gave his eulogy for Doug. Richard Bailey, banjo player with The Steeldrivers, read a eulogy from John McEuen (similar to text from John McEuen above) and made some remarks of his own. Ginger Boatwright and Kathy Chiavola then led those gathered in singing "Farther Away" and "I'll Fly Away." Ginger then gave her eulogy. She was followed by Doak Snead, Doug's son-in-law. Next, Bernie Leadon played "Banjo in the Hollow" and "Hickory Hollow." He then gave his eulogy (full text above). A sermon by Brother Frank Owens followed. And the service closed with Kathy Chiavola singing "How Great Thou Art" and "Lower Lights Be Burning." Burial near a beautiful large tree in the peaceful valley at Harpeth Hills Memorial Gardens immediately followed the service. Brother Owens said a prayer and Kathy Chiavola led those gathered in singing "Amazing Grace" a capella. "The women folk looked sorry and the men stood 'round and cried." The passing of Doug Dillard is truly a time that makes us cry. We cherish his friendship and the memories and music he has left us. And we will forever remember that infectious grin. That one makes us smile! We published the following photo in our special issue in May devoted to George Lindsey. We like it so much that we're publishing it again here. We think it's an especially good recent photo of Doug. ONE FOR THE AGES--This must rank as one of the all-time most special photos we've had the good fortune to witness. It was taken on January 25 outside Nashville's Sylvan Park Restaurant. Having just had a delicious "meat and three lunch" with a couple of other Goobers, this trio paused for a photo. 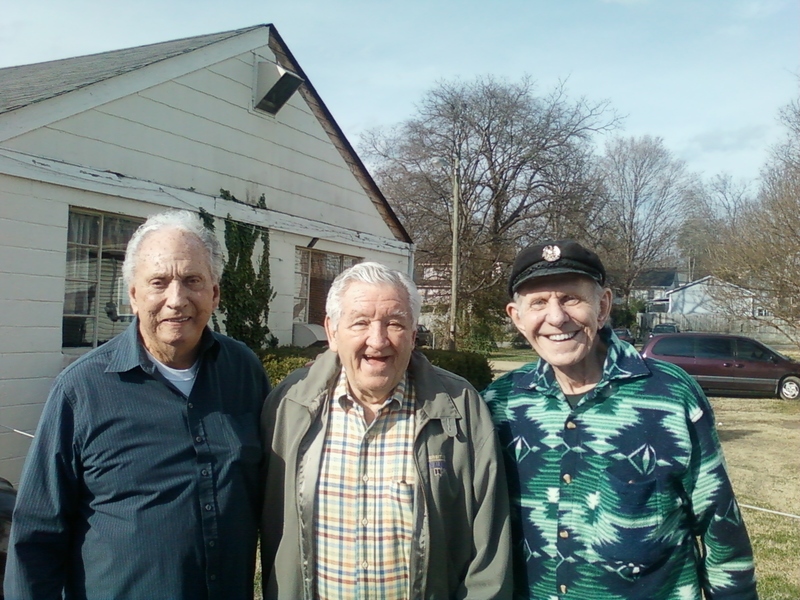 Left to right are legendary songwriter Curly Putman, George Lindsey and Doug Dillard. This is one of the last photos ever taken of George and Doug. They were together here, and it's comforting to believe they're now together again. Photo copyright Ken Beck. The next regular issue of The eBullet (originally scheduled May) has been bumped to mid- June with the next Weaver's Newsletter planned for later in June.